The resolution calls on OU and the Fred Jones Jr. Museum of Art to conduct provenance research on everything in its collection to determine if any pieces were "unlawfully appropriated during the Nazi era." It also asks the university to exercise the same diligence before acquiring any future pieces with an incomplete or uncertain history between 1933 and 1945. "If it is determined from provenance research that an object in its collection was unlawfully appropriated during the Nazi era without subsequent restitution, the House of Representatives hereby directs the University of Oklahoma and the Fred Jones. Jr. Museum of Art to resolve the matter in an equitable, appropriate, and mutually agreeable manner, including restitution," the resolution states. A copy has been distributed to OU President David Boren and the board of regents. 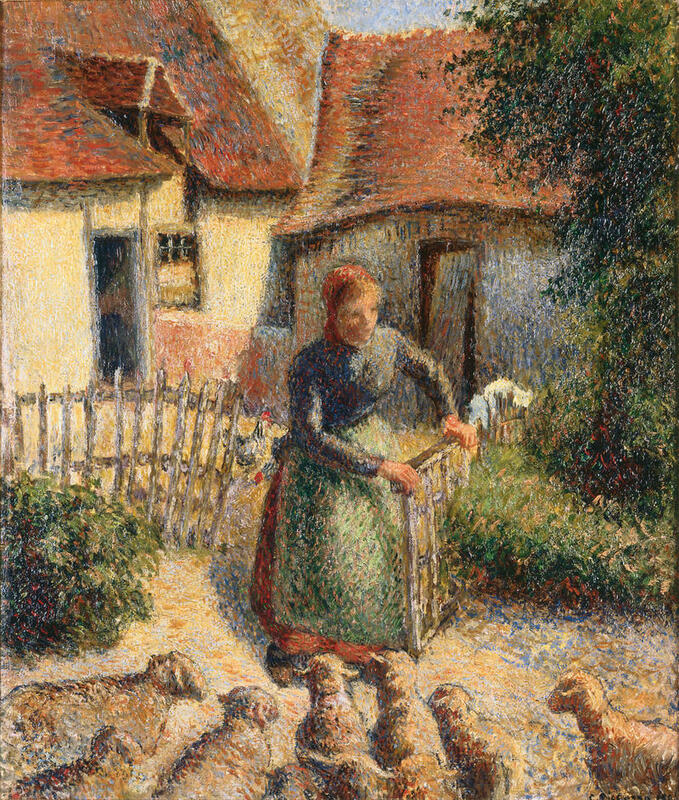 The painting in question is an 1886 oil painting by impressionist Camille Pissaro called "Shepherdess Bringing in Sheep" ("La bergère rentrant des moutons"). When the Germans invaded France during the war, department store owner Raoul Meyer's art collection was seized by the Nazis. The painting changed hands several times before a Swiss court ruled in 1953 that Meyer's five-year window to recover the painting had closed. “I have worked tirelessly to make sure my colleagues understand the story behind the painting,” said state Rep. Paul Wesselhöft, who's the lead author of the resolution. “It is simply shameful that the University of Oklahoma would choose to resist this attempt to right a wrong. These 26 House authors who filed this resolution want to be on the right side of history. I assure you others will add their names as House authors. Oklahoma oil executive Aaron Weitzenhoffer and his wife Clara purchased the painting, which The Oklahoman reports was just one piece in an extensive collection of French Impressionist art amassed by the couple during their lifetime. Clara Weitzenhoffer died in 2000, leaving 33 pieces of art to the OU museum. At the time, university officials said the collection, which included “Shepherdess Bringing In Sheep,” was one of the most important collections of French impressionist paintings given to an American public university. Max Weitzenhoffer, the son of Aaron and Clara Weitzenhoffer, said his parents never knew about the painting's connections to Nazi art theft. Max Weitzenhoffer, who serves on the OU Board of Regents, said he didn't know of any provision in his mother's will preventing the university from returning the painting to the Meyer family. University officials told the Associated Press the full history of the painting's ownership is not known. But in a statement, Pierre Ciric, an attorney representing Raoul Meyer's daughter Léone Meyer, said OU had a professional responsibility to investigate the painting when it entered the museum in 2000. Ciric says the Indianapolis Museum of Art in Indiana contacted the Fred Jones Jr. Museum of Art in 2009 with concerns about the painting's history. Ciric says Meyer provided two dozen pages of detailed provenance information about the painting in a 2013 federal court filing. During the 1998 Washington Conference on Holocaust Era Assets, the U.S. State Department and several professional museum organizations agreed to a set of principles regarding how to handle artwork plundered by the Nazis during their occupation of several European countries. As The Oklahoman pointed out, the Weitzenhoffers say they weren't aware of the painting's troubled past. But Ciric said a "good faith acquisition" of art isn't a legal defense to a restitution claim. "The overarching principle in the American legal system is that no thief can convey title, and subsequent good faith purchasers have an obligation to research the provenance of the artwork they acquire to prevent the very type of restitution claim such as in this case," Ciric said in an email. "Finally, the defendants in the case have chosen to mount as many technical defenses as possible. A good faith acquisition is not one of them." Last month, the Holocaust Remembrance and Restitution Society at the University of Oklahoma sent a letter to Oklahoma lawmakers asking for them to support their efforts to obtain restitution. "This Resolution is exactly what the Society had implored the Oklahoma State Legislature to do, to ensure the restitution of La Bergère and other artworks currently with OU's Fred Jones Jr. Museum of Art and which may have been plundered by the Nazi's [sic] from Jewish homes during the Holocaust," president L. Eric Sundby said in a statement.